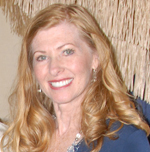 Louise has always loved to draw, decorate, and create with an eye to designing whatever she was making with a unique and personal touch. Louise was born in Ontario, Canada. In her early twenties, while working in Washington, DC and Virginia she began taking classes at the University of Virginia in acrylics and got hooked on painting. 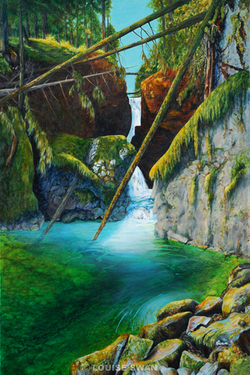 The canvas has become a way to extend her creativity and passion from the snow-bound winters and glorious autumn colours of her eastern roots to the greens, blues and mists of the mountains and shorelines of British Columbia. For her a few steps along a pathway have now become an odyssey as an artist. Many of her works are inspired by her early roots, spending much of her youth on, or, in the water. Her love of nature, water, animals and scenery has inspired her to capture this beauty with brush in hand. 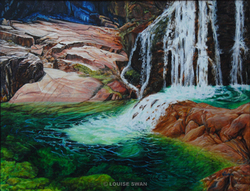 Whether sitting by a mountain stream hearing the water flow by or under the gaze of her beloved dog at the easel in the studio, Louiseâ��s painting style is treasured for its captivating reality and acute attention to detail. Expressing the wonders of sunlight and shadow, hues and contrasts is what illuminates every day and every painting. Louiseâ��s work has been influenced over the years through study with internationally known artists including Roger Arndt, Brian Atyeo, Tony Couch, Tim Deibler, Robert Genn, David Goatley, Brent Laycock, Mark Hobson, Terry Isaacs, Murray Phillips, Diane Maxey, Gordon MacKenzie, Claudia-Jean McCabe, Stephen Quiller, Michael Oâ��Toole, Janice Robertson, Brigitte Schreyer, Mike Svob, Liz Wiltzen, Alan Wylie and many others. Many thanks to all who have given of themselves to nurture and mentor me in my journey as an artist. 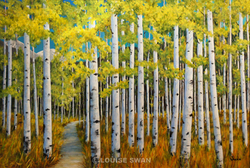 Louise lives in the Lower Mainland of British Columbia, Canada where her acrylic, oil and watercolour paintings are sold, treasured in local private collections and internationally. As an Active status and juried artist member of the Federation of Canadian Artists, she continues to explore new ways of expressing her love of painting and bringing her joy of nature to the fine art enthusiast everywhere.